It is tough playing man-to-man when coaches on the sideline keep insisting your team plays zone. Such is it with health care. For doctors, the man-to-man defense never ends. Stay with them. Glue to them. Move with them. Run with them. Defend against the bounce pass, or the dribble to avoid the admission. Hands up! Watch their waist, ignore the head fake. You shift your coverage to accommodate their needs. One on one, mana-a-mano. But for the business of medicine, it's all about the zone. Defend the admission basket against as many people as possible with the least number of defenders. Stay in your position. Work it 2-1-2, 2-3, or if you're really adventurous: 1-2-2. Stick to our limited number of defenses using small variations with the same number of people. Keep your hands up so you look bigger than you are! Don't let them near the hospitalization goal! We've seen all their plays and watched all their moves with our electronic record, so let's win this game! If the patients move left, you move left. If the patient moves right, you move right. Anticipate! How hard can it be? When you only look from the sidelines, everything seems obvious. But what happens when the patients change tactics? What if the patient's psyche or medical issues don't follow the typical playbook? Will our zone defense apply enough pressure on patients to affect change? Or will it apply too much pressure upon them, causing them to drop out of the game? Who wins then? When the bench is left too limited and the game extends too long, will the exhausted physician defenders be able to convince the coaches that there's a better way to play defense against these admissions? Every frontline health care professional knows that the health care game is played one patient at a time and on one court at a time. And yet, we see more courts being built and technologic advances being funded as spectators are sold on the illusion that doctors can suddenly play multiple games on multiple courts with multiple patients with an infinite game clock while never dropping the ball. Even now, the storyline remains: we cannot afford to play health care one-on-one. So the players become confused. They wonder (more than ever) who they're really playing for. The players wonder why they continue to see more money than God spent on the courts, the lights and the corporate skyboxes instead of the critical players themselves. Will our health care game be won by building more courts or by actually playing the game? How many administrative coaches do we need? Most of all, since its now come down to money versus care, how will we ever put doctors, hospitals and patients on the same team? The tragic tale of Flight 447 should not only be a case study in aviation but also in medicine. Medicine is becoming less of a hands-on science and more dependent on sophisticated tests and high-tech scans. As in aviation, there is an overall benefit; diagnosis and treatment are better than ever. But the same problem bedevils medicine, perhaps more commonly — in difficult situations, inexperienced doctors are often uncertain of how to interpret sophisticated information presented to them, resulting in incorrect diagnoses or inappropriate treatment. Call it an après-holiday reflection, but as I look back at 2011 and anticipate the year ahead it is only natural to ponder what the New Year will bring in of our evolving field of medicine. What might we expect in the year ahead? As the New Year begins, I suspect we will first see more of the same: more market consolidation with larger hospitals eating smaller, financially–strapped hospitals and doctors throwing in the towels of financial independence in favor of corporate employment or retirement. 2011 was the year that cardiologists realized their practice rug was irreversibly pulled out from under them by a 2009 national “stimulus package” whose changes to payments for office based imaging services kicked in on 1 January. Private cardiologists were left with few options to maintain their incomes besides joining with larger hospital systems. It was that same 2009 legislation that provided funds for Electronic Medical Records that gave government-mandated data collection legs. But the real effects of health care reform have yet to sink in. I expect healthier hospital systems will look for new ways to leverage their current financial largess with national name-brand centers of regulatory excellence to be maintain their public perception as “cutting edge.” With that, the use of data to improve clinical efficiencies while simultaneously using the data to market services will become 2012’s data-driven mantra. Like the fortune-teller’s crystal ball, those centers with the foresight and wherewithal to process and puree the large volume of clinical data spewed forth by today’s caregivers data entry personnel will be richly rewarded as new pressures to the cost curve surface. There will be a distinct competitive advantage to those who can simultaneously compare treatment, demographic, and socioeconomic trends in near real-time with an eye for more financially efficient care. The demand for this data to help to cut costs and maximize profits has already superseded the government’s ability to maintain patient privacy. Oh sure, we’ll still see a handful of large-dollar HiTECH Act and HIPAA violation penalties assessed to make it look like things are under control, but there’s a different reality now: clinical data leaks are worse than ever and not likely to be slowed any time soon. One only has to realize the extent of the mobile-medical movement and the innovations in hand-held devices capable of fully managing patients at a distance to appreciate the futile nature of the government’s ability to enforce the HIPAA/HiTECH acts. After all, despite the government’s heavy-handed wrist-slapping in this regard, I have yet to see a story of how the government recovered any of the data lost or how they rectified damages to those whose medical information has already been compromised. Shouldn’t that be the focus? Sadly, these rules have had another important downside: they put care providers in the impossible catch-22 of trying to maintain data security while health care is provided over larger geographic locations in near real-time, twenty-four hours a day. What do you mean they can’t use their cell phones to send clinical data to each other? The big news story of 2012 will be the Supreme Court’s ruling on the constitutionality of our new health care law’s mandate to purchase health insurance. Much of the fragmented Republican presidential candidates have vowed to “repeal and replace” the new health care law, but they would be better served to acknowledge that our health care system has already made massive irrevocable changes as far as doctors are concerned. Hence, repealing and replacing the PPACA will not change what has happened to our prior health care delivery mechanism. Americans should not think for a minute that going back to the days of old doctor’s offices on every corner is possible – it’s become too cumbersome and too expensive to do so. Instead, the local minor care will be by the likes of Rite-Aid, Walmart or Walgreens. For those who want to see a doctor, from now on a nurse might have to do. Appointments for skilled “care providers” will increasingly be made online or via kiosk. If a phone call is desired, large call centers with phone trees with built-in logic and recordings to check for “quality” will be our new reality as disposable administrative health care personnel are increasingly replaced by technology. Still, some independent doctors’ practices will survive for a while in the more affluent regions of the country. Cash-based practices will flourish thanks to a persistent demand for this care. Their challenge to this model will not be in providing care but rather getting the data to do so. Larger health systems in control of larger laboratory and medical record operations are unlikely to relinquish this data-driven power willingly. Whether these independent physician models will evolve to counteract this reality remains to be seen. Social medicine will continue its parallel track to conventional medicine. People will find support and suggestions from others. Need a good doctor? Ask your friends. Need some information? Ask a friend on line. If they don’t know the answer, they are likely to know someone who they know and trust who will. Think you were gouged on price for a procedure? Ask your friends. The truth will set us free. As patients are presented with more information faster than ever, social media will continue provide a potent concierge service to patients as they negotiate the ever-changing system before them. So there you have it. A few of my broad-based pie-in-the-sky projections for 2012. Will they materialize? I can’t be sure. But it's clear the health care cost piñata has burst. Sure there's still a scramble to pick up the few remaining financial health care candies lying around. But the end of our bountiful health care game is fast approaching and what next year's game will become is anybody's guess. Thanks to all the doctors and nurses who contributed. Wishing you all the happiest of holiday seasons! #4. Could a Bra Interfere With A Pacemaker or Defibrillator? Thanks for all of you who have taken time to improve these posts by leaving your comments and criticisms. You have made it a truly enjoyable and informative year. Happy holidays and here's to a great New Year of blogging in 2012! 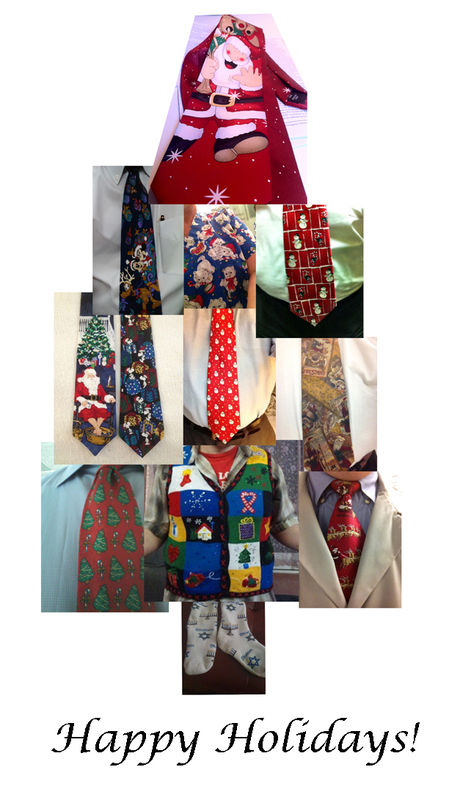 As a reminder, today's the last day to submit a quick picture of your favorite holiday tie, sweater, scrubs, shirt, underwear, socks - whatever - that I can use to photoshop a collage of gear worn by health care professionals all over the world for the holidays. (The original announcement has morphed by popular demand to allow submission of more creative forms of fashion expression.) Deadline is midnight (CST) TONIGHT. 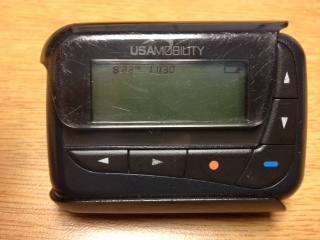 Remember to send a relatively small (<=350K or so) picture of the item to me at wes - at - medtees - dot - com. We've got a few pictures so far (tie pictured above was from Nick Genes, MD), but plenty more for the color pallate would be greatly appreciated. So what happened to the other 75% of reps? Some of them are now working for hospitals to make sales calls on doctors. Why? The hospitals want those docs, usually surgeons, to send their patients to that facility. Uh oh, this may be a problem. Reps are trained well. They are usually aesthetically pleasing (hospitals aren’t stupid) and they go after the doctors with the best insured patients. They mine data just like the drug companies did to find the target doctors. Read this article in the USA Today for more info. I understand why hospitals are doing this but there is something here that just doesn’t sit right with me. I sure wish they would reinvest their money into nurses so that their patient load is less instead of paying beautiful looking reps to flirt with doctors. Seems wrong. It seems wrong, because to doctors, it is wrong. But we're not talking about patient care here. We're talking about market consolidation and competition for the few remaining revenue sources out there as overbuilt hospitals race to feed the health care and consulting beasts that financially cannibalize the very people they claim to serve. 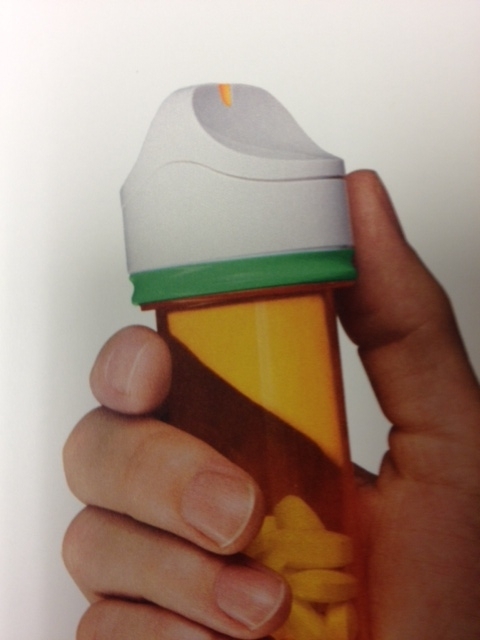 Just saw this advertised for patients taking Multaq (dronedarone): interactive pill bottle caps called "GlowCaps:"
GlowCapsTM is a bottle with built-in wireless communication... When you receive your GlowCapTM, you program it with your schedule. It will then remind you when it's time to take Multaq by lighting up, playing a melody, or calling your home phone. If you and your physician choose, your GlowCapTM can also send weekly reminder e-mail to you and a caregiver, send reports to your doctor, and refills can be initiated with the push of a button, if you provide a phone number when registering. GlowcapTM, manufactured by Vitality, Inc, has an embedded computer chip that communicates via low frequency RF with a cellular connected nightlight. The nighlight sends information to Vitality via a GE864-QUAD chip, over the AT&T GSM/GPRS network. Hence you must be in an AT&T wireless network area. But I do worry about alarm fatigue. And how much does this cost? Will patients just ignore their pills or even grow to hate their melodies? And what happens when everyone's pill bottles go off at the symphony? Or what about pill identification: "Doc, it's the one that sounds like a wind-chime." Finally, if I start getting e-mail reports (spam?) from patients regarding their Multaq pills, I really, really won't be happy. Just because technology can do all these things, doesn't mean it always should. Still, it shows where technology is taking us in a hurry. "What's your favorite color?" my brother asked me. I had never been asked that question before, so I had never thought about it. I considered my options: green (everyone's favorite at the time), yellow (somewhat bland), blue (depends on the shade), orange (the color of a fruit? No...), and then came my answer for no apparent reason at the time. Little did I know my older brother was colluding with my family (and Santa, of course) to decide upon the color of a new bicycle. The ruse was revealed at the end of Christmas morning when I followed a string whose one end had been attached to an ornament through every room in our house. It was only after following it to the dank confines of our basement was the surprise revealed. But for many, the Christmas season will be far removed from this Utopia. Some will hear the terrified cry if a woman screaming for help after her husband collapses before her. For others will come the wailing cry of a mother who learns her child just died. For others, they will witness the silent tears of a man who learns his certain fate after the diagnosis of cancer. For each of these, the depts of despair will seem insurmountable; the sadness, intolerable. So as I return to work this week, I count my blessings. For it won't be about the gifts that I receive, but rather the giving that will matter. As health care workers, we are invited to glimpse the inner workings of this complicated, messy story called life, a story that never stops. But in doing this, we are taken backstage to witness not just the frailty of the human body and spirit, but its remarkable strength, too. And while we know we won't be able to save everyone's pain this holiday season, know that we are honored to be given the privilege to try. Dr. Wes: On Medicare's Wearable Cardiac Defibrillator "Reconsideration"
In a brief burst of holiday enthusiasm, we worked on a special song today that came together after our fifth case for your enjoyment: The Twelve Days of Christmas, EP Style. Feel free to sing this song in your Electrophysiology Laboratory this Christmas season. And a pacer for a-sys-to-le. Bleary-eyed, I rose from bed, dressed, and was out the door. The cool air from the car window served as nature's wake-up call. The sky was clear, the moon hung brightly on the horizon and the cicadas’ shrill songs undulating high above. Driving in, the tires clapped rhythmically from one pavement segment to the next. For some reason the Emergency Room seemed farther away this night – perhaps because of my reluctance to go there. If the patient was pacemaker dependent, yet alive with a pulse and neurologic signs, the ethical dilemma was a real one: should I be responsible for stopping the patient's heart? Did the family really understand the implications of these actions? I turned the final time. The ER sign disrupted the dark sky. I parked and fumbled for my ID. The security guard looked remarkably cheery for that time of night. Reviewing the case, it was a horrible fall, cerebral hemorrhage, neurosurgeon empathically discussed the prognosis with the family and me – little could be done. On entering the room, what seemed like twenty pairs of eyes were upon me. Some older, some younger, older kids too. Questioning at first. Tearful. Some closed. It had been a long day. So glad I came. Others pointing the way to her, quietly huddled by his side, clutching his hand. She turn her gaze from him for a moment, offered a brief smile, then back to him again. "He was a great man," she said. Except for the c-collar in place, he looked regal - staring up without movement. He looked younger than his age, an active lifestyle I guessed. His endotrachial tube had already been removed. "We don't want him to suffer." I glanced at the monitor. 100% ventricular pacing. "We'd like the pacemaker turned off," they reinforced. "You understand that he might die as a result." "There's a chance his heart could slow significantly, and not stop." "We understand. If that's God's will." "Are you sure this is how he'd want it?" "And you understand what we're doing?" "Would you like to be the one to turn off his pacemaker?" "Honestly, no. But I'm his wife. This is how he'd want it." "I'll grab the programmer and be right back. I'm so sorry." I left the room, wrote a thorough note and pondered the situation as I walked to get the programmer. Usually some other metabolic derangement assists us in stopping the heart of patients with pacemakers - we don't usually turn them "off." The natural consequence of other confounding diseases work to cause a lack of oxygen, too much potassium, or another metabolic problem that disconnects the electrical activity from the mechanical. When the mechanical stops, it really doesn't matter what the electrical system does, since the pumping stops irrespective of the electrical impulses applied to the heart. I returned and checked the device. Naturally, there was still plenty of battery life left. The rhythmic sound of the monitor was heard in the background as I noted his underlying atrial fibrillation with ventricular pacing. The family huddled together. They gave Grampa a kiss. More tears. What was I doing? She held his hand, leaned forward, and whispered something in his ear. She did not cry. She was turned and shuffled to the programmer, assisted by her daughter. They stood together, arms entwined. The monitor was hushed, the waveform still visible. I handed her the pen and pointed to the spot to touch to program his pacemaker to "off." She looked at the others. They stood together, resolute, tears flowing. She touched the screen. The programmer responded to make sure that this is what she wanted. She confirmed, "Yes." The pacemaker responded in kind. A long pause, then a slow escape rhythm. We were all granted a reprieve. It was not time. A few more notes of the concert called life were still to be played. They thanked me. "Would you mind if we were alone with him?" I packed up the programmer and pulled the curtain to provide privacy. The monitor out side the room showed an escape rhythm just faster than before. I appended my note with the recent events, spoke with the ER staff, returned the programmer, and headed home. I was grateful that I could not predict the tempo of death. It was His concerto, not mine after all. As I drove home I noticed the moon was no longer visible on the horizon and in its place were millions of radiant stars. In the spirit of good cheer, I have an idea, but I need your help. 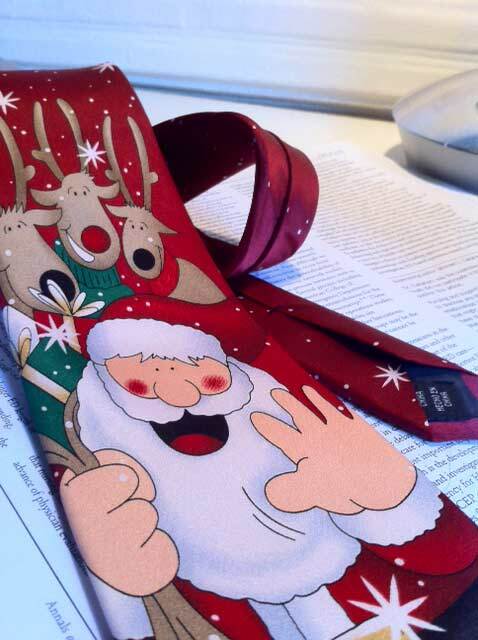 I need a picture of your favorite holiday tie or sweater. Not you, mind you, just a close-up picture or your tie or sweater. If you want, I'll try to include your name somehow, just let me know. Try to keep the image under 300K or so in size if you can (my inbox can only hold so many). And please, only one entry per person. The idea here is to make a collage of items worn by health care personnel during the holidays around the world that I will Photoshop together. I plan to post the image before Christmas for all to enjoy. Deadline for submission is midnight (CST) 20 Dec 2011. Send your entries to: wes - at - medtees dot com. So get out your iPhone or Droid and get snappin'! h/t: my brother-in-law on Facebook. It is a decision that is not made easily each morning. It takes a careful consideration of the anticipated caseload or clinic volume. It requires uncanny discretion as one weighs the acuity of the clientele to be encountered – a sensitivity, if you will, to their needs. He recalls the negativism toward the day’s concern and wonders if his choice has ever really hurt anyone. Imagine the horror if that were true! They are, after all, part of a larger collective, accumulated over the years that hang close to their war-torn brethren. He scoffs at the idea, but still wonders. Still, he will never forgot the face of the man whose wife had just died this same week, tears overtaking his lower eyelid as he described their love for each other, the children, the kids all there as she took her last breath. Home was so quiet now. “I just can’t bear going into her closet….” He paused as he tried to composed himself. Then he stopped, eyes full of tears but glowing. Yeah, the red reindeer-and-Santa one should do today. So then I wondered. 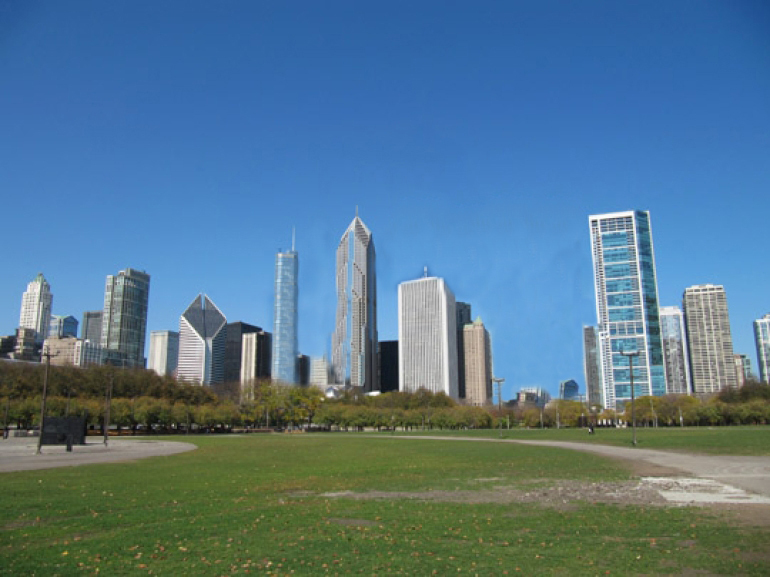 What would Chicago's skyline look like without medicine? 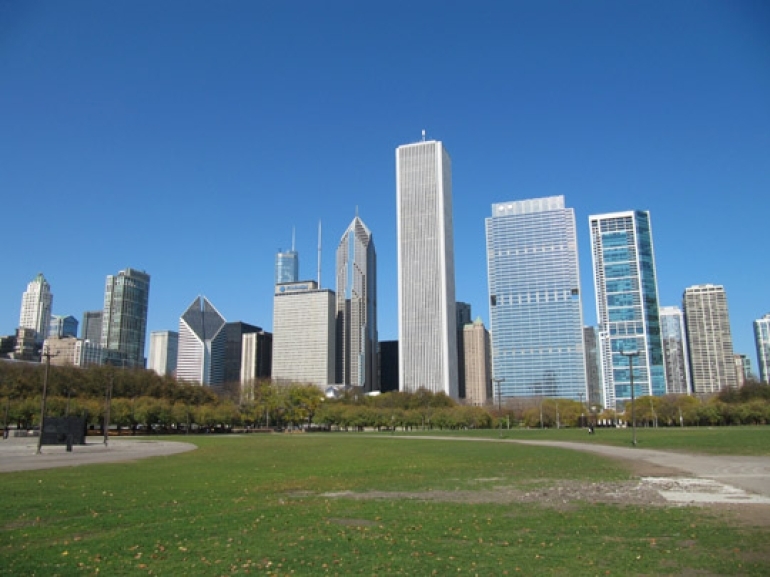 Chicago's skyline would look very different, indeed. "How are you feeling Ms. Jones?" "Have you been more short of breath lately?" "Not really, just when I exercise." "I dunno. But after I go to the mailbox and walk back up to the house, I’ve got to stop now where before I didn’t." Exertional dyspnea. It conjures up a large differential of potential cardiovascular or pulmonary causes. And as the above commonly-encountered doctor-patient conversation demonstrates, the problem is a dynamic one: at rest things are often fine, on exertion or with recumbency less so. Now imagine that the doctor then sees elevated neck veins, hears rales in the lower lung fields, and sees swollen ankles on their patient. Heart failure, right? Perhaps. But we should recall that heart failure is not a disease, but a condition caused by an underlying pathology. So a slew of diagnotic studies are under taken and if no easily correctable cause identified, symptomatic therapy started. If it's caught early or the ause identified, perhaps an admission will be avoided. But if things progress, Admission Number 1 for "heart failure" is chalked up on the books. Our new health care law requires (Page 8) doctors avoid expensive hospital readmissions by “intervening” on heart failure since this problem is one of the leading causes of readmissions to hospitals. These readmissions cost our health care system billions of dollars. To prove the point, millions upon millions of dollars have been spent to try to prevent heart failure admissions with the assumption that, surely, many readmissions are preventable and cost savings reflected to our health care system. We should acknowledge that better compliance with medications, careful management of one’s diet, and avoidance or behaviors known to exacerbate heart failure could be better avoided. For the motivated and highly engaged patient, improvements in readmissions can be made, but I wonder how much so: after all, they’re already the Compliant Ones. It’s the Non-compliant Ones and the Medically Challenging Ones that are the problem for our health care system from a cost standpoint. The Non-compliants are a particularly difficult bunch. They don’t want to think about their health. They want to think about this weekend’s football game, child’s graduation, their upcoming trip to Europe, or being able to pay this month’s bills. And there are many more Non-compliants than Compliants out there. They are not all Non-compliants because they mean to malign their doctor but rather because life gets in the way of dealing with daily health issues for them. And we’re not even talking about the problems inherent to people with severe shelter, social, education, family and economic challenges. Can we expect our health care system to impact all of these areas to prevent hospital readmissions? And the Medically-Complex Ones have their own challenges: maybe it's heart failure this week, then maybe a bout with a COPD exacerbation the next. Are they a readmission, too? An FDA advisory panel decided that CardioMEMS failed to prove that its wireless, implantable heart monitor's benefits outweigh its risks, casting a shadow on a potential $375 million acquisition by St. Jude Medical (NYSE:STJ) – which already owns nearly a fifth of CardioMEMS. The watchdog agency's cardiovascular devices committee decided that a clinical trial of the device, designed to be the first permanent heart implant for a solely diagnostic purpose, was warped by the assiduous care given to its participants. (emphasis mine) That's because the clinicians administering the single-blind trial knew which patients were implanted with the device and made sure they got specialized care. The panel voted 9-1 that the device is safe, but decided that the trial failed to prove its effectiveness on a 7-3 vote. The committee voted 4-6 that the benefits of the device, which measures pulmonary artery pressure, have been proven to outweigh its risks. Recall that this is the same fate that Medtronic's earlier right ventricular hemodynamic pressure monitor, the Chronicle device, suffered in 2007. But maybe we can make lemonade our of lemons when it comes to innovation to prevent heart failure. Maybe we can realize the importance of people interacting with people and the time necessary to assure better outcomes in heart failure. And maybe, just maybe, we should realize that even with all the technology in the world, expensive medications and expensive testing, that penalizing doctors and health care providers who spend the time with patients just because they present again to a hospital might be exactly the wrong approach to address our readmission issue. And maybe we should acknowledge that a good portion of the problem with hospital readmissions starts outside hospitals, not in them. Given the number of sections of the Patient Protection and Affordable Care Act that read "The Secretary shall...", today's single-handed overruling by the Secretary of Health and Human Services' Kathleen Sibelius of the FDA's recommendation to permit the emergency contraceptive Plan B One-Step to go over-the-counter based on years of scientific analysis, should put us on notice. Recall that Ms. Sibelius has no medical or scientific degree. To my knowledge, today's action is unprecedented. Could the FDA, with their requirements for funding from pharmaceutical companies to review cases like this, have a conflict of interest in regards to their decision? But such an autocratic, non-scientific veto by a single individual in charge of the entire United States' health care policy smacks of dictatorial power and should not be taken lightly by the scientific community or the citizens of this great country. As Goes the Post Office, So Too Medicare? The Center for Medicare and Medicaid Services will require pre-payment audits on hospital stays for cardiac care, joint replacements and spinal fusion procedures, according to the American College of Cardiology in a letter to members. Shares in both industries fell with Tenet Healthcare Corp., the Dallas- based hospital operator, plunging 11 percent to $4.18, the most among Standard & Poor's 500 stocks. Medtronic Inc., the largest U.S. maker of heart devices, dropped 6 percent to $34.61. The program means hospitals won't receive payment for stays that involve cardiac care or orthopedic treatment until auditors have examined the patient records and confirmed that the care was appropriate, Jerold Saef, the reimbursement chair for the Florida chapter of the American College of Cardiology, wrote in a Nov. 21 letter to members. The review process is expected to take 30 days to 60 days, beginning January 1, Saef said. This is not at all unexpected. In fact, in our field of cardiac electrophysiology, we have known this day would be coming; our expensive, life-saving gadgets and gizmos are easy targets upon which the government can cut its rationing teeth. And so as it will go for us at first, and then for many other areas of health care. But the government has no idea how to do this, really. They don't have the data, the cerebral wattage, acceptable information systems, nor manpower. So, the government will grow further to offset it's shortcomings in order to assure they can "save money" for our health care system. But CMS, like the U.S. Post Office, has a dirty little secret: they don't pay very well. To offset their low pay, they have to offer some pretty nice benefits to attract their best and brightest. And because the government is now going to bite off trying to manage an entire country's medical procedure rationing during a limited eight-hour government workday, they are going to be flooded with calls, many of which will be frustrated, angry calls that have been on hold a very, very long time. And so they'll hire more people to improve services. And pretty soon it will dawn on them: this is expensive to do. It will just be a matter of time when, like the Post Office that was seiged by their inability to keep up with pension and health care costs, they'll surrender and turn over their efforts to private enterprise. Of course the insurers don't want this. They already know it's too damn expensive to take on the risk of our paying for the health care of our aging seniors. (They were one of the main proponents of health care reform, remember?) So the government will have to have their back somehow. (Those details still have to be worked out, but it'll happen because politically, it must). And the final transformation of our health care system of the future will be complete. More info available at Larry Husten's Cardiobrief blog. As health care reform rumbles along, it has become increasingly clear that electronic health records (EHRs) are here to stay. I dare say, most of us are relatively happy that the change has come: notes are legible, information moves quickly, communication channels between doctor and patient are improved, and work flows streamlined. A notice appears in the doctor's EHR results in-box notifying him that a new EKG result is available for review. Ideally, the doctor attaches a "result note" explaining the results to the patient and the result forwarded to the patient electronically. So the patient is called and another hand-typed electronic telephone note added to the patient's electronic health record to document that the patient was informed of the result. 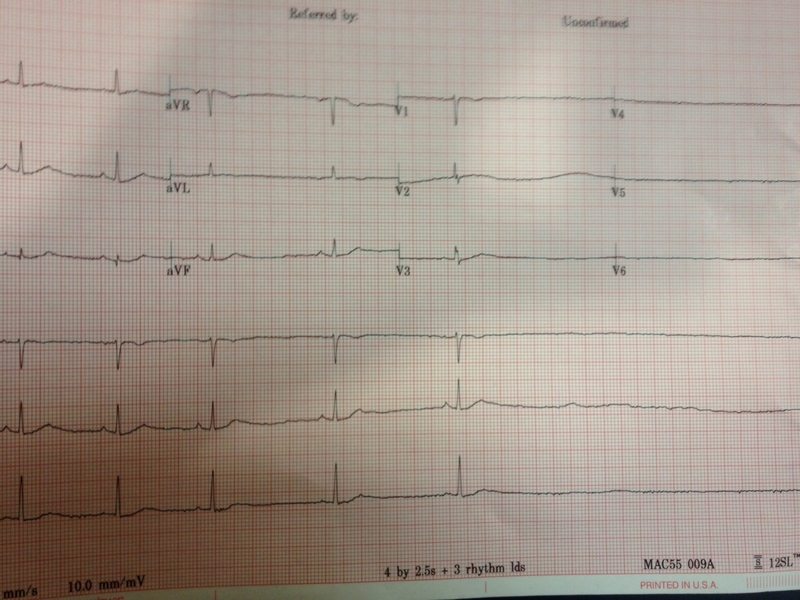 All of this time, energy, effort, for a single EKG. Now, multiple that by ten EKG's, three echos, two chest-xrays, and a partridge in a pear tree that gets ordered on our patients each day and you've just created "result bloat" for doctors. 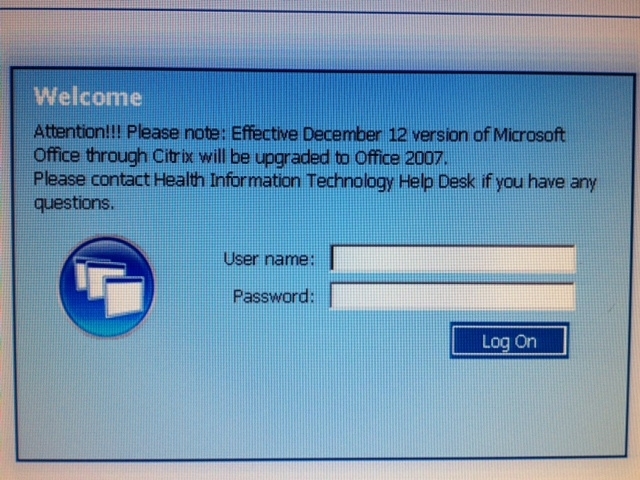 When a single test result must be "resulted" three or more times by the attending physician because of constraints of conjoined information technologies, not only do we demonstrate meaningful use of our electronic medical records, but we also demonstrate meaningful abuse of our doctors' and support staffs' precious time. First we saw "note bloat." Now we're seeing "result bloat." "The students of today are training for a field that doesn't currently exist." Seems hard to believe, right? And yet, when I started medical school, there were no iPhones. In fact, there weren't even cell phones. My first cellphone was acquired while I was in fellowship training and came with a shoulder bag to hold the battery pack. (Man, was I cool to have one!) When I started as an intern, if I wanted to see a patient's chest x-ray I headed down to the file room to check out the patient's xray folder containing all of the films performed on the patient at that hospital and physically removed the particular film of interest from the folder and placed on a lightbox to review. Gosh, we even still had had and used manual blood pressure cuffs. Things sure have changed. The pace of innovation in medicine has been staggering. 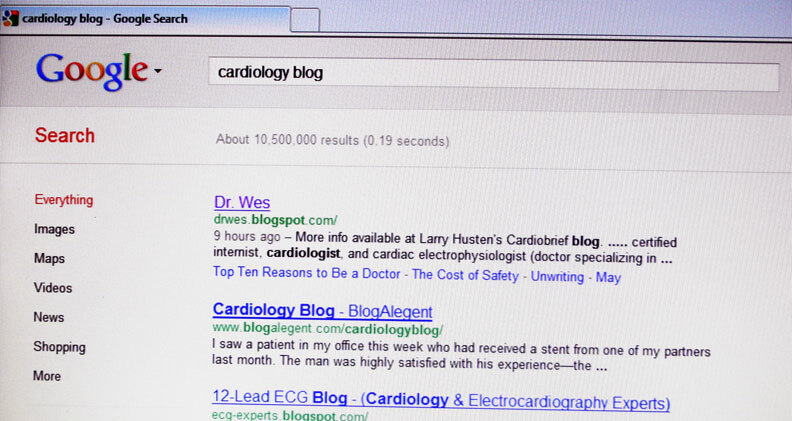 Who would have thought you'd need to have typing proficiency to become a doctor? Electrophysiologists, once the boring antiarrhythmic testers of ischemic ventricular tachycardia, don't just test arrhtyhmias, but now routinely ablate them permanently. Stents, unheard of just 20 years ago, are now commonplace. And percutaneous aortic valve replacements and mitral valve repairs? You've got to be kidding me! Congestive heart failure too, once a pre-morbid condition, is now become chronic disease Public Enemy #1 (never mind the dirty truth that it's the innovative drugs and devices that keep people alive and have cost our health care system so dearly). As a result, "readmissions" for heart failure, the inevitable end run of all heart disease, have become a cardinal sin for hospitals thanks to our new health care reform law, punishable by non-payment. Which leads me to contemplate where things will end up ten or twenty years from now under continued governmental belt-tightening. Will our medical students be better served to learn more medicine, or will should they be shifting their focus to business in an effort to forward themselves? Who will doctors find themselves serving more, their patients or their employers? Will the greatest challenge in health care be promoting life or will it be to promote a death with dignity and without expensive end-of-life care? How will doctors be paid: by salary? By specialty? Or maybe by an obscure, non-transparent concocted "work unit" that an outside hospital consultant group creates? Like it or not, the medical world is rapidly morphing into a business-oriented world. Everything will have a cost and a benefit. It's the "to whom" that will be where doctors' influence will come in: the financial benefit to a hospital system will not always be in the patient's best personal interest. Strattling this divide will be doctors' greatest challenge for all doctors going forward. But new medical students should not lament: there will still be tons of opportunities for them. Rather, they should accept that right now, this minute, they can have no idea where their current priorities and technical, clinical, and social skills will take them. But they should know this: they'll really need to stay flexible. Because the only thing unchanging in medicine right now is change itself. "I am a bi-lateral above knee amputee (I have no legs!). I would like to thank you for providing us with shirts that keep our sometimes sick sense of humor going. Joking around about it is a big part of my rehabilitation. I am a Marine and I lost both my legs in Iraq along with three of my friends who are also bi-lateral and one who is a single above knee. We laugh about it all the time and have fun with it, cause how else can you cope with something like this. " "Loved the philosophy behind your t-shirts. I bought two, one for my oldest daughter Teresa and one for me. Teresa is a cancer survivor. She loves the shirt, but mostly she appreciates the care associated with it." "I wanted to thank you for your efforts and creativity in the t-shirts that you have put out. I had a Long QT incident and was dead for about 7-10 minutes. I was saved by my 8 year old son who dialed 911 and was doing rescue breathing on me when the paramedics arrived. I really like the "Death" t-shirt and the QT shirt. My husband even said that the QT shirt would promote questions by people. Thank you for bringing laughter to such a serious subject." Happy holidays to you all and thanks for making this so much fun. I participated in a recent case-based discussion via a Medscape audiocast with Ted Feldman, MD and Rina Silver, APN from our institution on the challenges of managing patients post-coronary intervention who also have weak heart muscle function. ... to bring you Pharmagossip's infomercial. Time to Say a Techno-Goodbye? "If you want to save all lives, you're in trouble," said Callahan, co-founder of The Hastings Center, a bioethics research institute in New York, and a faculty member at Harvard Medical School, in an interview. "And if you want to save all lives at any cost, you're really in trouble." Callahan and co-author Nuland, a retired professor of surgery at Yale School of Medicine who wrote the best-selling "How We Die," were both 80 when the article was published. "We need to stop thinking of medicine as an all-out war against death, because death always wins," said Callahan. That said, McKoy believes doctors have a responsibility to spend medical resources where they do the greatest good. They must police themselves — otherwise, the government will come in and do it for them, she warns. This is not easy, she said, describing the tremendous pressure doctors are under to perform procedures and prescribe medicine that will not help. And, she said, they often give in. "We get selfish families, and it's often easier for doctors to pull out prescription pads," she said. "Doctors need more often to say no, to say (if a patient is dying): 'We will give you palliative care, but not give you chemotherapy. We will not give you new expensive drugs because it will not make you better.'" Likewise, medical schools also need to train students to understand the cost-effectiveness of treatments, and to administer them based on medical research into their effectiveness — not just because they are available. While I agree that the doctors on the ground should be making these decisions, I, too, have problems with a central regulator imposing a random age limit where all services to functional seniors stop. More importantly, this article ignores another reality for doctors who must make these difficult decisions: the nearly unlimited liability exposure if the family members disagree with all members of the health care team, including hospital ethics panels. It's good we're having this discussion. And yes, since doctors are increasingly employed by hospital systems eager to fund their operations, pressure continues to mount on proceduralists to offer newer and advanced therapies to patients. But it's not all about the money. There really ARE wonderful therapies out there for seniors these days and, thanks to the virtually unlimited marketing of them to elders (especially via direct-to-consumer advertising) seniors will continue to demand them. Adding fuel to the procedural fire, lack of liability protections for health care facilities and doctors who opt not to treat a patient for some very good reasons will further add pressure on doctors and hospitals. Once again, because of special interest resistance to malpractice reform, centralized government control will become the default option. And maybe, just maybe, we need to rethink our stand on direct-to-consumer advertising of expensive medications to the populace on the Nightly News. What's the Most Important Question to Ask Before Getting Your Defibrillator? Answer: How many have you done in the past year? If the doctor says 37 or more, you should be in very good hands. Reference: Freeman JV, Wang Y, Curtis JP, Heidenreich PA, Hlatky, MA. "Physician Procedure Volume and Complications of Cardioverter-Defibrillator Implantation." Circulation 2011. When the world's leading cholesterol-lowering "statin" drug, Lipitor, goes generic tomorrow, doctors will bear the brunt of the conversion with little information about what the new drug will cost for their patients. This, of course, is the plan. How much cheaper will generic Lipitor be? Insurance copayments should drop considerably, if patients are getting Lipitor or atorvastatin on the generic tier of their health plans. Currently, Lipitor has been on a higher, branded tier for prescription drugs. Copays for branded drugs average either $29 or $49 depending on the tier, according to Kaiser Family Foundation. Copays for generics average $10. In addition, Ranbaxy Laboratories Ltd, one of the generic manufacturers of generic Lipitor, won concessions to maintain elevated prices for 180 days from the government (a la our own Food and Drug Administration while the Federal Trade Commission stands idly by complaining how consumers are gouged with this arrangement) to assure prices stay high a bit longer. But if we forget the insurers and copays, how much will the generic drug actually cost consumers? That's because everyone else has to make sure they make their cut first. Pharmacy benefit managers, the leeches attached to nearly every prescription written today, have to strong-arm their position in the ever-competitive pharmaceutical profit by "pre-negotiating" prices for consumers wed to even more insurance plans with varying deductibles and co-pays. Even Pfizer, not wanting to exclude itself from the profits inherent to such a non-transparent system is offering it's own "generic version" through Watson Pharmaceuticals. Theoretically it would be good for the public to have multiple generic manufacturers competing for generic Liptor's market, driving prices down. However, this natural self-regulating market function cannot occur to the benefit of consumers due to the blocking of actual drug price comparison. Insisting on tranparent retail pricing of the medication's pre-insurance costs would greatly facilitate consumer choice of statin in the doctor's office. Someday, one could imagine a Consumer Reports spreadsheet in the same way they rate appliances and automobiles. But then again, it seems we can't do that because it would serve the function of weeding out our hidden pharmaceutical middlemen. It wasn't the fact that pop-star Lindsey Lohan's father, Michael Lohan, was hospitalized that caught my eye, nor was it the splashy headline: Michael Lohan Struggling to Speak, Breathe. What caught my eye was the picture that accompanies the article that reportedly shows Mr. Lohan asleep in his hospital bed. Is this picture of a man who is "short of breath" authentic? Since there is no oxygen tubing and no pulse oximeter applied to the pictured patient's finger, we are left to wonder. But what if the picture IS authentic? What will happen as a result? Will this photograph be ignored? For hospital administration and government regulators, this would pose an enormous problem. If not ignored, will the perpetrators be brought to justice? What financial "lesson" will be levied against them? It is frightening to consider how an investigation of such an obvious lapse in patient privacy might be conducted thanks to the implications to health care facilities imposed by HIPAA. Will all the nurses on the unit be placed on administrative leave until someone squeals? Or maybe the cleaning staff? Maybe the family themselves? Perhaps the whole hospital will have to attend HIPAA refresher courses. Perhaps the ward should be closed until the problem identified. And what about the hospital administration who have permitted such an egregious lapse in governmental policy? What fines will be levied against them as a result? Will hospital costs for future patients be adversely affected as a result of these fines? What is clear is that the ability to maintain patient privacy is quickly becoming impossible to manage, thanks to the explosion of hand-held cell phones and miniature cameras, not to mention the requirement for electronic medical records for those receiving government-funded health care. Real patient privacy remains a local challenge, not a universal, governmental one. Sadly, in our attempt to provide global governmental privacy protections, we forgot to protect those that are most affected when breeches occur: the innocent workers and patients themselves. ... over at the Diabetes Mine blog. Yes, I'm thankful I don't have to use this old medical kit either (but the pics are cool). I was sent an e-mail from Amy Tenderich of the well-respected Diabetes Mine blog asking for contributions for this Thanksgiving’s edition of Grand Rounds. I sat with this a while and really struggled to find a topic. “It would be nice to creative writing,” I thought. So I sat and stared at the computer. “Just write. It’ll come together,” she said as she returned to the afternoon’s dishes. After I calmed down, I took out a fresh piece of paper and wrote. I wrote mountains of disjointed sentences without a central core. A stared at the page, dissatisfied. I wrote some more. Somewhere in the back of my might hid a thought, an overarching theme that failed to materialize despite my best attempts. I kept writing and writing as if somehow, some way, I’d force it out of me. Finally, out of frustration, I brought my work back to her. And we were off. I watched a master at work. She had a remarkable knack for diction and the written word. She reveled at the chance to add a verb, an adjective, a noun that changed the ordinary into the extraordinary. She’d stop and ask, “So then what?” and I’d explain. Red arrows would link concepts and ideas; a roadmap to clarity formed before my eyes. “You need to expand on this,” she’d say. Then I would return to my thoughts, frustrated at how hard this was to complete. Would it ever make any sense? But as I sat and thought some more I realized that she was right, not so much about the topic, but about the process. Then write some more. Be willing to toss aside the perfect stand-alone nuggets of writing that make things too verbose and distract from your message. Keep those that clarify and sharpen it. Then process the thoughts and re-work them until the final composition develops to something larger than what you had anticipated. Like an acceptance letter to medical school. And before you know it, you’re not just a doctor, you’re a writer, too. Details about the case are quite specific and the case reports heralds from a town in Minnesota. It describes, in very specific detail, the management of a patient who presented to the emergency room in shock from cardiac tamponade after a catheter ablation procedure for right ventricular outflow tract tachycardia. Is this unique case report HIPAA compliant? I would say, according to our current definition of HIPAA's "personal health information," such a case report is not HIPAA compliant. Nor could such a case be mentioned on a blog, for that matter, even though it presents important information for people dealing with these patients. There is an important quality-of-care role in telling these clinical stories. In fact, HIPAA states there are just "18 little rules" that doctors are supposed to follow when they report important clinical cases. But details about cases may need to be very specific. Specific case reports can bring important specific clinical details to the attention of the medical community. For instance, if doctors had not been willing to describe several cases of pulmonary vein stenosis or two cases of esophageal perforation in a major medical journal years ago, how many more people might have been injured as a result? But there's problem giving such details about clinical details about patient cases: "the small cell problem:"
Clinicians should be sensitive to the "small cell problem": the existence of individuals with such unique or unusual diagnoses or illnesses, that it might be possible for others (or patients and families themselves) to identify the individuals in case reports or medical text books based upon limited information, such as state or city of residence, age and diagnosis. The "small cell" problem violates HIPAA and HIPAA means business: millions of dollars of business that gets released in press releases from the Department of Health and Human Services when they catch their prey. But doctors should not be afraid of publishing case reports especially since there are good reasons for them clinically. Further, when doctors make good faith efforts to conceal patient's personal information in those reports, they should not be subject to threats of HIPAA's "small cell" problem. Simply put: the "small cell" problem is HIPAA's, not the doctors'. Extending the definition of personal health information as defined by HIPAA to include "any other unique identifying characteristic" about a patient's case limits doctors' ability to improve care to our patients while greatly increasing our legal culpability for that effort. It's not easy keeping up with technology when things move so fast. EBR Systems, a start-up out of Sunnyvale California, and Cambridge Consultants, the technology design and development firm, have developed a leadless pacemaker system for patients with advanced heart failure. The Wireless Cardiac Stimulation System (WiCS) comprises two units, an implantable electrode and an external control unit. The electrode incorporates an ultrasonic, wireless receiver and delivers an electrical stimulus to the heart based on triggering signals from the external control unit. In its current iteration the WiCS system is designed to work with conventional pacemakers/defibrillators pacing the right ventricle of patients requiring biventricular pacing. 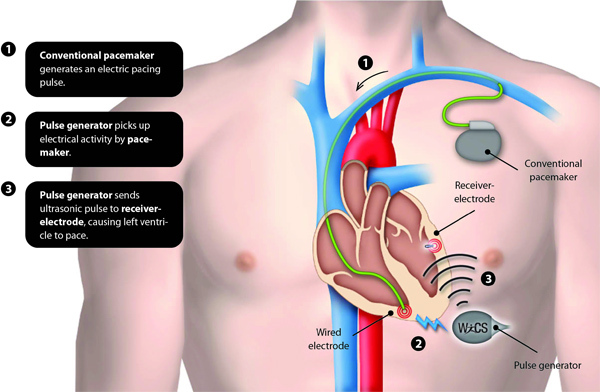 The WiCS external control unit senses the pacing stimulus delivered to the right ventricle and initiates a burst of stimulus from the electrode implanted in the left ventricle. According to the company, the wireless left ventricular pacing approach removes the need for complex surgery and the complications often associated with the coronary sinus leads used to pace the left ventricle. But to suggest that a left heart catheterization to place their little device in the endocardium of the left ventricle "removes the need for complex surgery" is a stretch. Embolic complications, valvular complications and the potential for stroke complications (with the need for at least some anticoagulation) will quickly temper their enthusiastic press release. 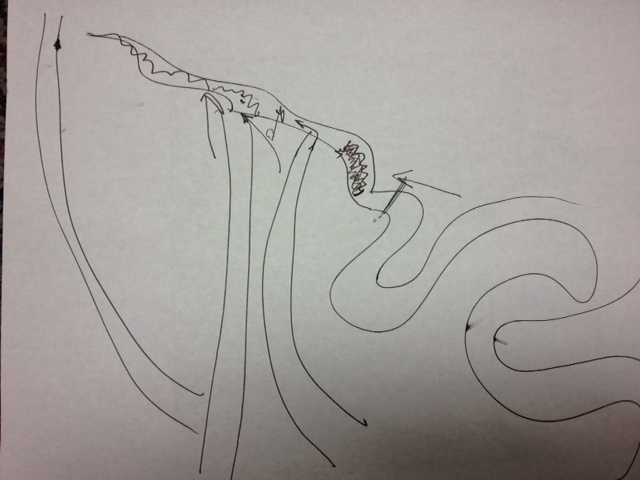 And what happens when a patient needs an ultrasound of their heart or has a capsule endoscopy? Could there be significant electromagnetic interference? But we should not rain on these companies' parade too quickly, even if they are a bit late to the party. The implications of this technology as we move forward with more sophisticated pacing therapies are profound. One only needs to consider complex congenital heart cases with anomalous venous return, epicardial delivery of this technology, or its capability to paired with drug delivery systems in the future to see where things might go with such a novel means of pacing. At the start of each case, I still have to pinch myself when I contemplate the wonder of it all. 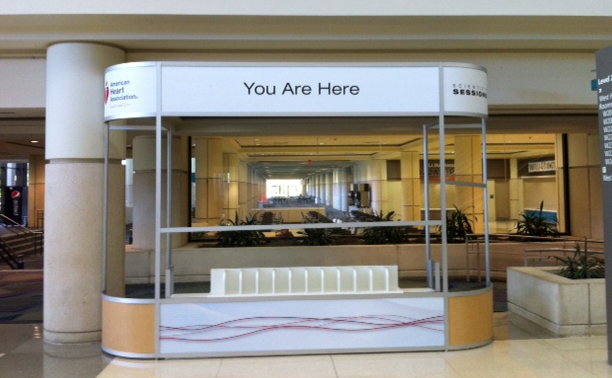 With all the mobile devices and internet connectivity available to doctors attending these meetings now, perhaps a more relevant sign should have read: "Be Here Now." The new study consisted of Madsen and his fellow researchers sending out surveys to every pediatrician and family practice doctor in Washington State. They received a good response–surveys were returned by 72 percent of pediatricians and 56 percent of family practitioners. 28 percent of doctors surveyed failed to always ask if a teen experienced chest pain during exercise. 22 percent of doctors surveyed failed to always ask if the teen ever fainted without a known cause or explanation. 26 percent of doctors surveyed failed to always ask about early deaths in their family history. 67 percent failed to always ask about heart disease in their family history. I still think this case was cool, so I'll link to it once again. Is this how Multaq (er, dronedarone) got such an early mention in our latest atrial fibrillation treatment guidelines? I've always wondered, especially after we later learned that there might be a few unsavory issues with this drug. Still, I have no doubt the need is there. Glad to see that my annual membership fees are being put to such good use. After all, up until now, it really HAS been hard interacting with industry reps when they brought lunch. Don’t get me wrong, it wasn’t their professional demeanor or their knowledge of their device or drug. No, that wasn’t it. It was just so hard to explain to them why I had to dine and dash. Now, thanks to you, I won't have to. I'll just spend more of my limited time getting down with industry personnel so we can share. Imagine: having smart people we can talk to about our latest, coolest case so they can record how much money they spend on our get-togethers. That's efficiency exemplified. I'm especially impressed that the ACCF training of industry personnel will occur every two years. I was worried about quality of our industry reps' knowledge base, so I'm glad you've made this effort a full-time job. (By the way, I had NO IDEA the ACCF now has a vivarium for all this training - when did you guys spring for that?) Impressive. Rest assured that I'll be SURE to check for your ACCF Training Logo on their business cards before I help myself to a gyro. I'm sure you're really collecting those fees to help lower the cost of my patients' medical devices and drugs in an effort to support their "positive health outcomes." After all, it's this cost thing that's reaking havoc on our health care system, right? (I wish I had thought of such a clever way to address this problem). h/t: Larry Husten over at Cardiobrief. "I estimate these changes to your charting work flow will take only five minutes." Five minutes is fine if it happens for only one patient. But when it is multiplied by as many as forty patients in a day, the multiples get impressive. Five minutes x forty patients = 200 minutes (more than 1.5 hours a day). Minor five-minute changes to administrative charting requirements aren't so minor, especially when you add more time for quality assurance reporting or pay-for-performance initiatives. Suddenly huge swaths of time from a doctor's opportunity to take care of their patients. We need more care time and less data entry time. Doctors must insist that we not become data entry clerks. Increasingly, I see the data entry burdens of regulatory health care documentation requirements falling on doctors. On first blush, this seems logical because only doctors (or very capable, highly trained surrogates) understand the nuances required to make potentially life-altering adjustments to the electronic medical record. But when new administrative documentation requirements are added to doctors and other care providers, it compromises our time with patients where we explain the mechanisms of their disease and its management nuances. Discussions of medications, therapies, and required follow-up get get short shrift to mandated governmental documentation burdens. If we want to maintain patient volumes to improve access for new patients, we must get creative. After all, time is not expandable. And there could be a better way. I believe we need to get patients more involved in their own care before they see their doctor. Imagine a patient entering proposed changes to their list of health problems, surgeries performed, medications and doses being taken and allergies before they are seen on their cell phone or local waiting-room computer terminal or iPad. These proposed changes could then be reviewed, validated, a approved (or not) by their doctor leaving the majority of the patient visit for what matters: actual patient care. Then maybe, just maybe, I could salvage four of those five precious minutes for both of us. Many health professionals do not see social media-based research replacing more traditional study methods, because not everyone uses the Internet or social networking. But they expect data gathered from social media to play an increasingly larger role in addressing public health issues. "Social media has huge potential for public health," Dr. Fisher said. "I don't think that people have even begun to realize that potential yet." Smile! You're on Candid Camera! They sat anxiously waiting for their loved one to enter the holding area after the procedure, one nervously clutching her purse, another today's paper, and a third, her cellphone. The air was tense as they awaited the news of how the procedure went. All the preparation, the concern, and the questioning come down to this moment when they learn if they made the right decision to go forward with the procedure. Will there be elation or despair? So of course they want to videotape the moment. The door opened, there was their loved one, looking no worse for wear, followed by the doctor. As he came forth to tell them the good news, the cellphone video recorder captured the discussion, the elation, the "thank you's," and the specifics about the case. It was done discretely and not noticed until the end of the conversation with the group. The doctor was caught completely off-guard. In this case, the news was happy. All went well. But what should happen if the news weren't so good or even devastating? We have entered an era where instantly-available photographs and video loops are becoming a way of life for many. YouTube, Facebook, and Twitter are everyday household words. More and more people own cellphones capable of uploading photographs and video content in seconds to the internet. And people bring these marvels of technology into hospitals and clinics every day. What this will mean to patient privacy, HIPAA compliance, and the sanctity of the doctor-patient relationship remains to be seen. But one thing's for certain, surveillance cameras are showing up everywhere and not likely to go away. We have to ask ourselves how are we going to take care of 32 million more patients in 2014 with a limited number of physicians to care for them. Better yet, how are we going to do this and save money doing it. Thanks to our central regulators, they have already figured out how to do this: forced productivity. The term itself brings to mind images of outer Siberia or Chinese sweat shops. Lower costs and expect the workers to do more to make the same income. Perhaps you haven't heard this term in our President's health care reform speeches. But it's out there as a lynchpin in the brave New World of medicine. I heard this term listening to a recent lecture by banker Steven Lipstein, the new Vice Chair of the Board of the Patient Centered Outcomes Research Institute (PCORI) established under the Patient Protection and Affordable Care Act during a recent lecture at our institution. He is also President and CEO of BJC HealthCare in St. Louis, MO who also serves as Chairman of the Board of Directors of the St. Louis Federal Reserve Bank. But as I listened to Mr. Lipstein I wondered, how and when will forced productivity end? How much forced productivity can doctors tolerate before they snap. How many hours can they endure when no workday or geographic restrictions are in place for them while residents and medical students saunter home after an eight-hour work day? How much forced productivity can they endure to repay their huge medical school loans? Most importantly, what debts are incurred by "forced productivity gains" to patients? If patients think their doctors are busy now as they stuggle to get an appointment or feel rushed when the do get an appointment, just wait. Mr. Lipstein understood the principles of the new health care climate well when he explained how we got to where we are today. What he doesn't understand at all, however, is the unintended consequences that are likely to occur as a result of these changes. You see, doctors don't keep bankers' hours. Yesterday, the FDA approved Edward Lifescience's percutaneous transvalvular aortic valve replacement catheter for human use. Despite this, it appears unlikely that implants of these valves will progress in short order due to concerns of demand for the expensive technology in the era of increased scrutiny of device utilization by payers, especially CMS. Which constraints will be placed on cardiologists and which institutions will be approved for this technology are issues still being considered. At the current rate, it appears unlikely at this time that this technology will be deployed before the end of the year. One new trend in cardiovascular circles (and a trend that is very politically-correct in our new "Accountable Care Organization" era of medicine that also plays well with health care marketing teams) has been the installation of new, very expensive 'hybrid' catheterization laboratory/operating rooms capable of transitioning from a conventional operating room to a catheterization laboratory (or back again) in larger hospitals. It is clear that patient selection for percutaneous valve procedures will likely require collaboration between cardiothoracic surgeons and cardiologists and some valvular procedures may require both specialists in complicated cases. 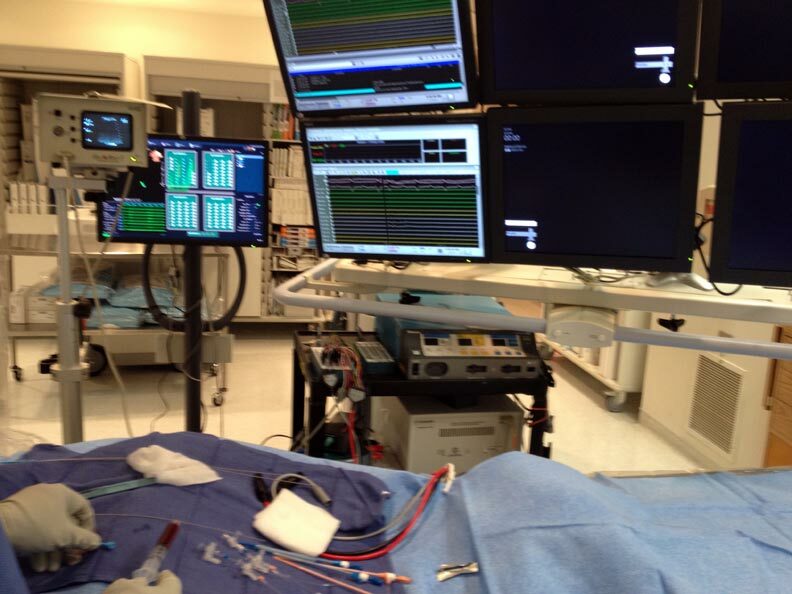 While staged DaVinci robot procedures with angioplasty probably won't be common, these fancy "hybrid" operating rooms (OR's) are much more likely to be used for percutaneous valve implantations or even atrial fibrillation ablations using simultaenous epicardial and endocardial approaches. "We just knew that whatever you call it, if you want to use the negatives and call it Obamacare or any kind of care you want to, it won't work. It can't work because all you have to do is use common sense. You have this emplosion of people, you have diabetes, you have one person in America that weighs more than the other two, you got guys who choose tobacco, choose booze, choose to use designer drugs, and all of them will be taken care of. You've got pre-existing conditions in three year-olds - what happens throught their sixty, or fifty, years of life? All you have to do is forget the charts and know that if you torture statistics long enough they will eventually confess and know that this country cannot exist on any kind of situation where a guy who could buy this buidling gets a $150,000 heart operation and doesn't even get a bill. Now that's nuts and that's where we are in America. No affluence testing. You gotta raise co-pays, you gotta knock down providers, you gotta deal with physicians, you gotta have hospitals keep one set of books instead of two - that will be a start." Be sure to see former Clinton White House chief of staff Erskine Bowles add his two cents, too. You have to wonder: is anybody listening? h/t: My office manager (yes, they've all seen it). It's one of the more common questions I hear from family members before I take their loved one into a procedure: "Can I watch?" For me, the answer is simple: no. First, the doctor performing the procedure has enough to think about without having to be a tour guide to a family member. Even something as simple as a pacemaker battery change can go very wrong if an operator is distracted long enough to accidentally reverse the atrial and ventricular leads when they are reattached to the new pacemaker pulse generator. Second, if something should occur that is unexpected during a procedure, a doctor needs to focus on the problem at hand without having to deal with the physical and psychological well-being of a family member also. Third, the operating room has all kinds of unusual sights, sounds, and (often unexpectedly) smells to which many people are not accustomed. If a family member becomes lightheaded, nauseous, or hits the deck as a result of these powerful stimuli, it can make for a very long (and embarassing) day indeed. A 47-year-old man living in a group home in Chicago's Uptown neighborhood died Monday night after he tried to remove his heart pacemaker from his chest, officials said. The man, who lived in the 4700 block of North Winthrop Avenue, was pronounced dead at 11:33 p.m. at Advocate Illinois Masonic Hospital, according to the Cook County medical examiner's office. Chicago Fire Department paramedics were called after the man told a worker in the home that he was experiencing chest pains and asked them to call an ambulance. The man returned to his room, where he remained until paramedics arrived, police said. When they did, he complained to them about chest pains and was taken to the ambulance where he fell unconscious, police said. As paramedics were trying to revive him, they discovered a puncture wound on the upper left side of his chest, police said. At some point, police were called when it became apparent that the man had been stabbed, police said. After the man was taken to the hospital, a doctor told police that the man had apparently tried to remove his pacemaker himself, police said. It was not known what the man used in that attempt. Pacemakers and their leads become densely encapsulated with fibrous tissue within weeks of their implant. As such, their removal is not as easy as it may seem to the casual observer. I know this sounds obvious to most, but if you're having chest pains, please seek medical advice and do NOT attempt to remove your permanent pacemaker. h/t: Ves Dimov, MD via Twitter.